Most people who are not completely familiar with blackjack could be forgiven for thinking the only options you have in the game are to hit or to stand. This is not the case – in fact, there are several options of how you can proceed in blackjack, depending on what cards are dealt. One of those options is doubling (or doubling down). Doubling in blackjack is a strategy employed by player when they deem the total of their hand leaves them in a favourable position to beat the dealer. In order to double down, you must place a bet equal to your original wager in exchange for one more, and only one more, card to be dealt to your hand. The majority of games only allow a double down to take place immediately after the player has been dealt his or her first two cards. By hitting (and not doubling) after being dealt the first two cards, the option to double down thereafter is forfeited. 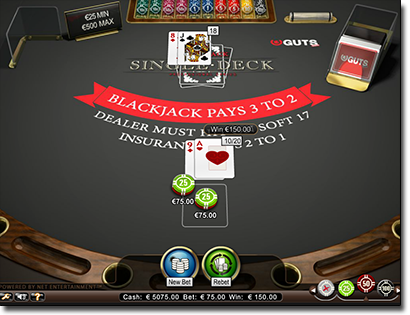 There are however a few online blackjack variants which do allow a player to double down at any time throughout the hand, even after being dealt three or four cards, though these can only be played by international players only (Australians cannot gamble online as of September 2017 due to the Interactive Gambling Amendment Bill). Other games impose a restriction on the hand’s total as to when a player can double down (typically allowing players to double only on two-card totals of nine, 10 or 11). If players double and win their hand, they receive a 1:1 payout of their new total bet. So if a player wagered $20 originally and decided to double down (betting another $20) on a two-car total of 10, received a King, and thus forced to stand on 20, beating the dealer, he/she would now be paid a winning profit of $40. There is a right way and a wrong way to go about doubling down. This article will run through the situations where a player should double to maximise their profits. Hard vs soft hands – what’s the difference? If you are dealt a two-card soft hand, this places you in a more favourable position to double as a two-card hard hand of the same total. But what is the difference between a hard and a soft hand? A hard hand is a hand without an Ace (or with an Ace which must be valued at one in order to avoid busting). A soft hand is hand with an Ace, with the Ace holding the flexibility of being used as either 11 points or one point. If dealt, for example, a 10 and a Five, it is unadvisable to double down. However, if you are dealt an Ace and a Four which totals either vive or 15, the threat of busting is not a factor and you are in a strong position to double and better your total. Doubling down is however, absolutely dependent on what the dealer is showing. What does the dealer’s face-up card reveal? The card the dealer is the main contributing factor in your decision to double down. Certain cards will give the dealer a better position to draw near to or to 21. Lower cards lean towards a dealer bust, thus giving the player a better shot to double. Deuce: bust percentage is 35 per cent. Three: bust percentage is 37 per cent. Four: bust percentage is 40 per cent. Five: bust percentage is 42 per cent. Six: bust percentage is 42 per cent. Seven: bust percentage is 26 per cent. Eight: bust percentage is 24 per cent. Nine: bust percentage is 23 per cent. 10: bust percentage is 23 per cent. Ace: bust percentage is 17 per cent. Double on a hard total of nine against a dealer up-card from Three through to Six. Double on a hard total of 10 against all dealer cards except a 10 card or an Ace. Double on a hard total of 11 always, unless the dealer is displaying an Ace. Soft strategy is dependent on the dealer’s up-card, but takes advantage of the Ace’s flexibility. Soft totals of 13 and 14 should be doubled when the dealer shows a Five or Six. Soft totals of 15 and 16 should be doubled when dealer displays a Four, Five or Six. Soft totals of 17 and 18 should be doubled when the dealer shows a Three through to a Six. Note, if the game does not allow players to double on a soft 18 total, players should therefor stand. Many players are reluctant to double down as they are not willing to risk doubling their bet. However, doubling can be very profitable and you should take advantage of the situation when the time is right. Follow sound strategy and you can significantly improve your odds of winning and trumping any run of bad luck. Taking advantage of doubling when the correct opportunity presents itself not only puts the player in a position of power, but it lowers the house odds, too. Note: Being able to double after splitting a hand reduces the house edge by about 0.13 per cent, while only being allowed to double on hands totalling nine, 10 or 11 increasing the house edge but about 0.25 per cent. The following online casinos are all compatible with mobile and tablet devices, are regulated, licensed and are legally available for overseas players in countries where online gambling is legal to play at with real money.